Using your personal shredder is a thing of the past! Who has time to waste in front of a shredder that either jams or overheats every 5 mins? 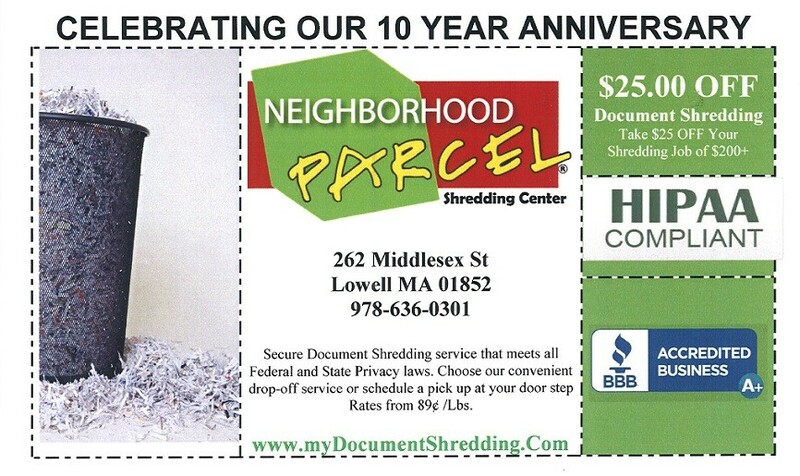 Neighborhood Parcel has developed a great shredding service plan that can fit any budget. Known for our low flat rates and commitment to document security, Neighborhood Parcel is now the shredding service company of choice for hundreds of local residents, medical practices, legal firms and accounting agencies. Our Shredding rates have no hidden fees and we proudly post them online for all to see. In addition to our low shredding fees, using the above coupon will save you an additional $25 off your first shredding job! Why pay shipping carrier book rates when you can save by using an independent shipping center like Neighborhood Parcel? As an independent shipping center, we avoid paying Royalty fees, franchise fees and pass the saving to our customers. In additional to our low International shipping rates, here you will find some exclusive Discount Coupons to lower your FedEx, UPS, and DHL shipping charges! Using this discount coupon can save you up to 15% off DHL, FedEx, and UPS International shipping rates. 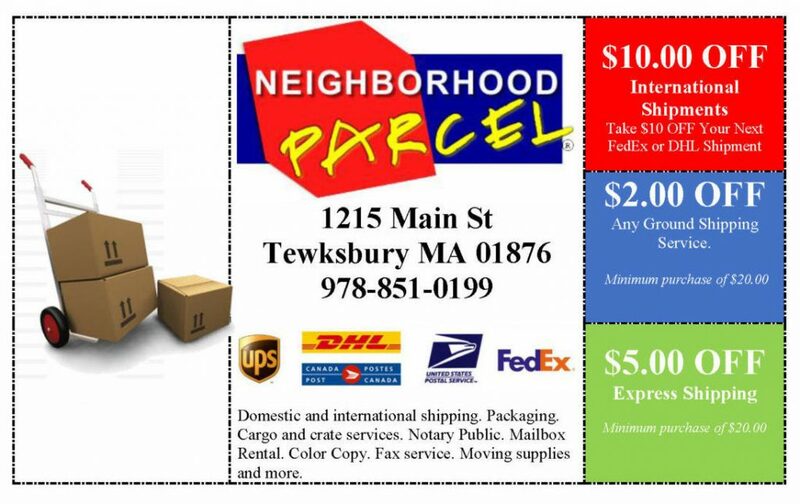 Our customers from Andover, Boston, Dracut, Lowell, Chelmsford, Tewksbury, Billerica, Haverhill, Methuen, Lawrence, Acton, Westford, Cambridge, Arlington, Chelsea, Medford, Bedford MA, have relied on Neighborhood Parcel for over a decade to be the place for all their domestic and International shipping services. Click on the image, it will pop up on a new tab. Click CTRl + P to print the coupon or select FILE then Print. Feel free to share the love on your social media!